EDIT: Giveaway is officially closed. Congratulations to Alessandra for submitting the randomly chosen 154th entry. The sun is shining, the birds are chirping and the faeries are fluttering in anticipation of spring. 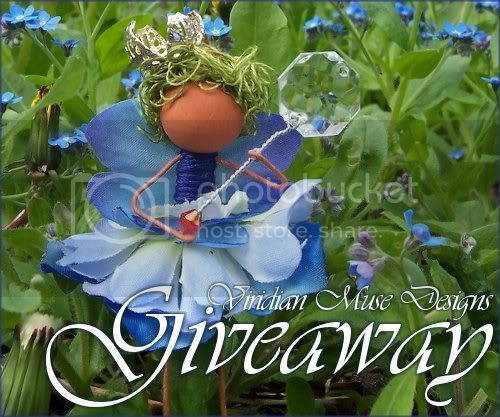 To celebrate the coming season, Chel of Viridian Muse Designs is giving away two cutely custom flower fairy dolls. The winner can choose a hair, shirt and skirt color for each, as shown in the fourth image of the best friend fairy set listing in her Etsy shop. Chel can also embellish each with a magic wand or charm on request. The flower fairies can both be made into ornaments, pins or clips - whatever the winner wishes! A single day doesn't go by without Chel sitting down to make some form of art or craft. In addition to bending and twisting fairy dolls to suit her muse's calling, she also creates watercolor paintings, sharpie marker artworks, artist trading cards, postcards, and greeting cards. Her giveaway prize pack will also include an ACEO sized (3.5" x 2.5") watercolor fairy painting. Use the Rafflecopter below to enter to win Chel's fairy doll giveaway before 11:59pm EST on April 5, 2012. I adore the little fairies! http://www.etsy.com/listing/94037820/amelia-white-flower-fairy-ooak-ornament is my favorite! Thank you for the opportunity! I think the Purple Fairy is cute! My favorite item is Audrey Flower Fairy OOAK Ornament Yellow and Orange Art Doll. I like the Red Fairy Custom Handmade Faery Ornament Doll! The Calliope Flower Fairy is the darlingest thing. A special friend. I like the pink valentine fairy. My fav one is Truli Flower Fairy Red Gold and Green Ornament! I really like the amigurumi sheep! So cute! Baaaaa~! I like the Red Fairy Custom Handmade Faery Ornament Doll. I like the purple fairy! I love the yellow fairy! I love the Fairy Girl Personalized Name Prints. my fav is Truli Flower Fairy Red Gold and Green Ornament. I love the Baanard Amigurumi Sheep! The colors are quite lovely. I really like the Love Big as a Whale Original Wall Art Square! The Purple Fairy is cute. My favorite item is the Custom Purple Fairy Ornament or clip. My favorite is the Custom Purple Fairy Ornament. My favorite is the Fairy Photo Portrait Gaia Fantasy Photography. I like the fairy girl personalized name artwork, they would be cute for my little girl.